© Anna Rich 2009 In recognition of the Rev. Dr. George F. Dole’s contributions to the Assembly and his life-long expertise in Biblical studies we are approaching the first week’s Biblical theme a bit differently this year. We will look at the Biblical narrative as a whole and lecturers will choose whatever aspect of the Bible narrative they would like, but focus their discussion through the lens of Rev. Dole’s latest work: A Book About Us. The general focus will be the Biblical portrayal, through correspondence, of the birth and growth of the relationship between God and human beings over the course of life. Each lecture will focus on a specific time period or a specific dynamic of that process. 2. Rev. 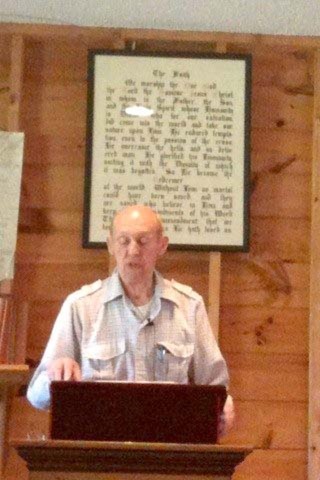 George McCurdy “Overcoming the Loss of Idealism: Haggai 1:4-5"
1. Rev. Judith Vandegrift "Real Independence"
2. Panel of the Week's Lecturers "Q&A"
Jesus Christ and Swedenborg are both clear and adamant that faith, doctrine, and worship are nothing if they are not lived out in the context of daily life in the world. The theology, interpretation of the Bible, and understanding of the Divine and human that the Lord has given Swedenborg to present in his spiritual writings has come to be known as “New Church” and forms the basis for the world view of Swedenborgians everywhere. In the meantime, the world we live in --- more specifically the society, culture and technology we live with --- are changing at a remarkable pace. In this week’s lectures, we will examine the various issues, blessings, conflicts, and problems that face those who attempt being New Church in a new world. 1. The Flames (teens) "A Different Perspective"
2. Rev. Gladys Wheaton "New Jerusalem Consciousness"
1. Rev. Lee Woofenden and Rev. Hunter Roberts "I Have Seen the New Church and It Isn't Us" and "New Wine in New Bottles Part 1"
2. Rev. Lee Woofenden and Rev. Hunter Roberts "I Have Seen the New Church and It Isn't Us" and "New Wine in New Bottles Part 2"